CRUISE CONFIDENCE WITH When it comes to crafting high-performance machines, motorcycle master Paul Teutul Jr. is an expert. 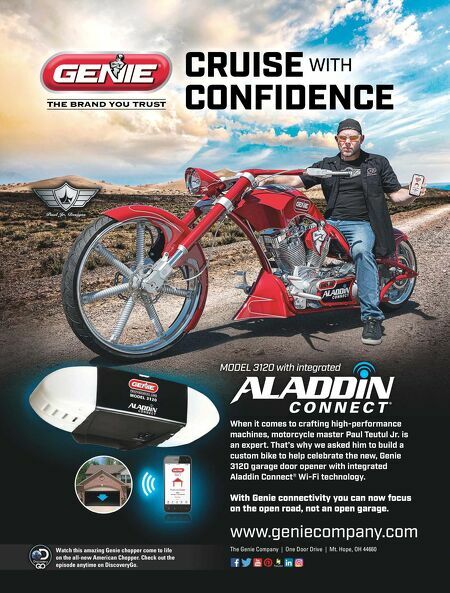 That's why we asked him to build a custom bike to help celebrate the new, Genie 3120 garage door opener with integrated Aladdin Connect® Wi-Fi technology. With Genie connectivity you can now focus on the open road, not an open garage. www.geniecompany.com The Genie Company | One Door Drive | Mt. Hope, OH 44660 MODEL 3120 with integrated MODEL 3120 with integrated Watch this amazing Genie chopper come to life on the all-new American Chopper. Check out the episode anytime on DiscoveryGo.